So you feel like you’ve seen it all, there are bicycles, unicycles, skateboards and scooters, but nothing really new, nothing you could look at and say, cool, that looks like it could be fun. Well, I had just such a reaction at the 2011 International Toy Fair in New York, when I was introduced to the Sbyke, a very cool, patented rear-steering scooter. See the video HERE. This product is receiving rave reviews from racing celebrities. In fact, Sbyke has already joined forces with the Michael Jordan of Motocross, Ricky Carmichael who is currently the NASCAR Camping World Truck Series driver, with the hopes of bringing the Sbyke into the racing pits. 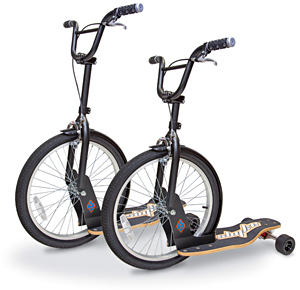 The Sbyke is certainly something that can appeal to the whole family, mom and dad can use it just as well as the kids, although, as usual, it seems like the kids are capable of pushing this thing to a whole other level of wheeled entertainment. The Sbyke passed rigorous testing before being granted it’s patent by the patent office, both in the U.S. and internationally. Preproduction is underway, with initial models released this fall. The company also tells us that you’ll see the Sbyke right next to bicycles, skateboards and scooters. Oh my. You are right…loved your take on the SBYKE. It’s a thrill to ride for all the generations!